Discussion in 'iPad' started by TheDeviceUser, Oct 22, 2014. 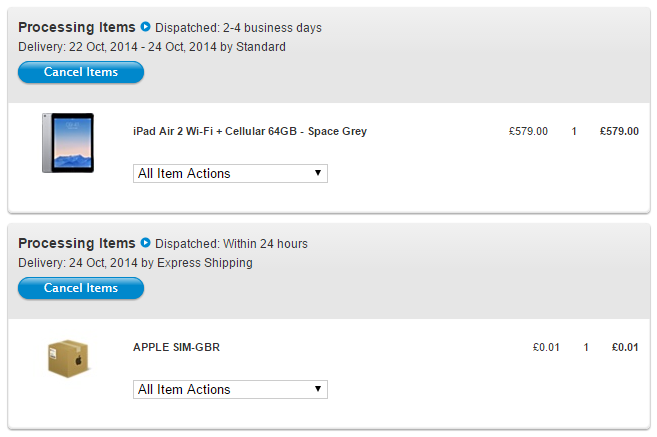 I ordered an iPad Air 2 on Friday as the pre-order's went live. I had received notification of expected delivery between 22nd - 24th October. However, this morning, I checked and it had slipped to 28th - 30th. However, I've just checked again and it's changed to this. 1) Before, there was no separate shipping for Apple SIM, now it's showing separately. Does this mean I'll get Apple SIM and iPad seperatley. 2) Even though they haven't dispatched, will I still get it for the 24th? 3) It has changed from 'Standard Shipping' to 'Express Shipping'. What does this mean? Will I get items quicker. Your help here would be appreciated. Thanks guys! Nobody knows right now, but it seems to be happening for everyone. Mine has done exactly what yours has, except the iPad itself is still showing standard delivery (the SIM was standard but has since changed to express). I have actually just noticed that mine has lost the option to add a gift message. Not sure if that's a good thing or not. I can still add a gift message. Has yours changed or is it still the same? Still the same, unfortunately. Hopefully they get it off tomorrow for Friday delivery. My bank isn't showing the charge yet in my statement, but the money has gone from my useable funds now. Ah... Mine hasn't gone to shipping yet, just hoping it will tonmorow! Still on 'processing!'. Luckily I'm in all day on Friday so I'll be able to get my package! Are you still confident we'll get them for Friday if they haven't yet shipped? I wouldn't say 'confident' lol. But if they ship tomorrow, I don't see a reason they won't come Friday.